Ensure traceability, collaboration, and code and test coverage from requirements definition all the way through to testing and release. codeBeamer ALM’s Requirements Management functionality helps you specify, manage, and trace the coverage of software requirements throughout the process of development. 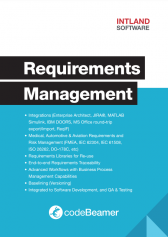 codeBeamer ALM’s requirements-related features are tightly integrated into its Application Lifecycle Management capabilities. Therefore, they support the product requirements management process in a holistically integrated manner. 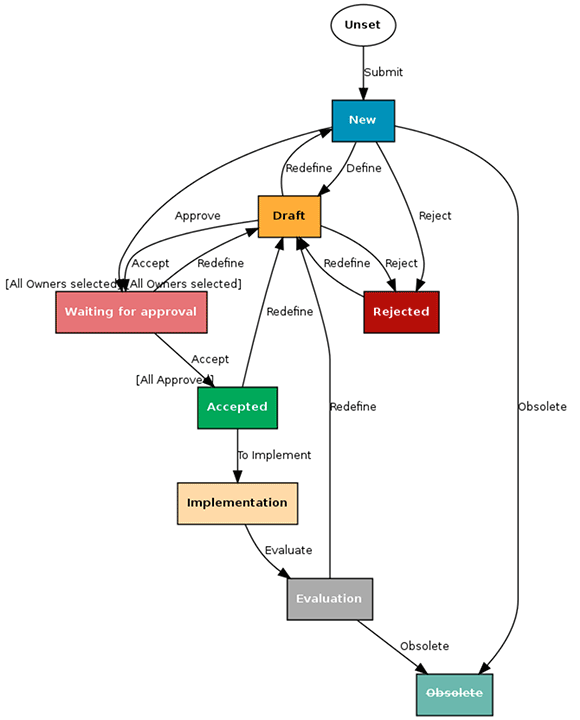 Requirements or user stories can be associated with all artifacts downstream and upstream (source code, tasks, bugs, issues, tests, releases, etc), providing gapless traceability across the entire software development lifecycle. codeBeamer is a fully web-based requirements management tool that enables you to import, share, re-use, and manage product specifications in collaboration with internal or external stakeholders. The requirements branching feature supports multi-stream development with advanced permissions, and the re-use of work items across branches. Through its document management, wikis, visual modelling, and team and project management capabilities, codeBeamer ALM enhances teamwork in your requirements management processes. Its Slack integrations help implement ChatOps to accelerate development. The optional Variants Package helps the management of complex product lines. Requirements libraries let you re-use specifications from similar projects, further supporting the management of multiple product variants. The test coverage of requirements can be monitored and analyzed, and requirements-based testing is also supported. Advanced analytics tools help you stay on top of your requirements management processes, and easily exportable dashboards support reporting. codeBeamer ALM is an all-in-one requirements management software tool, but you can also easily integrate it in your existing development environment. It has a flexible REST API for custom integrations, and offers built-in integrations with MS Office tools, SAP®, JIRA®, Enterprise Architect, MATLAB® Simulink®, and IBM® Rational® DOORS® (via ReqIF) to name just a few. For a full list of integrations, see our Integrations page. Capture, collaborate on, and manage requirements using codeBeamer’s preconfigured, but flexibly customizable requirements trackers. Create custom requirements approval processes to enforce security, transparency and accountability. Save requirements in libraries for re-use in future projects, saving a great deal of time and redundant work when managing multiple product variants. Maintain change control with a complete history of all changes to your work items. Generate test cases from requirements, and display all relations between artifacts using the Traceability Browser. You will also be warned of suspected links automatically. Conveniently check the test coverage of all requirements using a dedicated Test Coverage Browser with coverage statistics. Create branches off a master development trunk for multiple development streams. Compare and merge branches, and granularly control what is merged and what isn’t. Create immutable baselines of your development streams. Build multiple product variants without driving up the costs of development. Reuse requirements with the test cases that verify them to cut the costs of product verification and compliance. Facilitate the exchange of data between internal and external stakeholders, and the various software tools and platforms they use. Ensure data consistency through codeBeamer’s out-of-the-box integrations with several tools, allowing you to collaborate and stay on top of changing requirements. Take advantage of codeBeamer ALM’s round-trip export/import functionality with MS Office: documents with hierarchies can be exported with custom templates. Upon reimporting documents, you’ll be notified of any changes, allowing you to granularly review, approve, or reject modifications. Manage 30,000+ requirements in a single ReqIF file conveniently. Create custom integrations relying on codeBeamer’s REST API. Take advantage of codeBeamer’s connection to the Tasktop Integration Hub for seamless data transfer across 50+ tools. codeBeamer ALM’s advanced workflow feature with Business Process Management capabilities enable the customization and enforcement of complex processes. Automate data synchronization between tools, and add guards with optional (compliant) e-signatures that ensure only authorized personnel can change or add requirements. Process enforcement between requirements, tasks, test cases and other artifacts help you maintain quality and compliance. Automate the creation of further work items based on specific triggering conditions (e.g. automatically create risk items for requirements with high severity ratings). Stay on top of your approval processes with the (separately purchased) Review Hub, a powerful tool that helps you better satisfy customer needs with high quality products. The Review Hub helps simplify the reviewing process by enabling you to collect and assign work items for review with just a few clicks. The Hub also helps granularly manage the approvals process via a user-friendly review dashboard. Review all changes to customer specifications or test cases, as well as the impacts of these changes conveniently. Export review statistics to accelerate reporting. 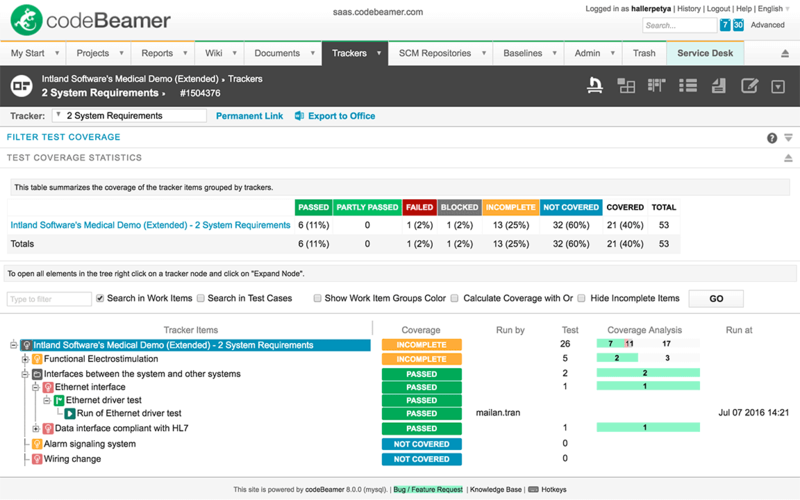 Download codeBeamer ALM free for Windows or Linux, or start a cloud-hosted SaaS evaluation. The trial version expires in 30 days. 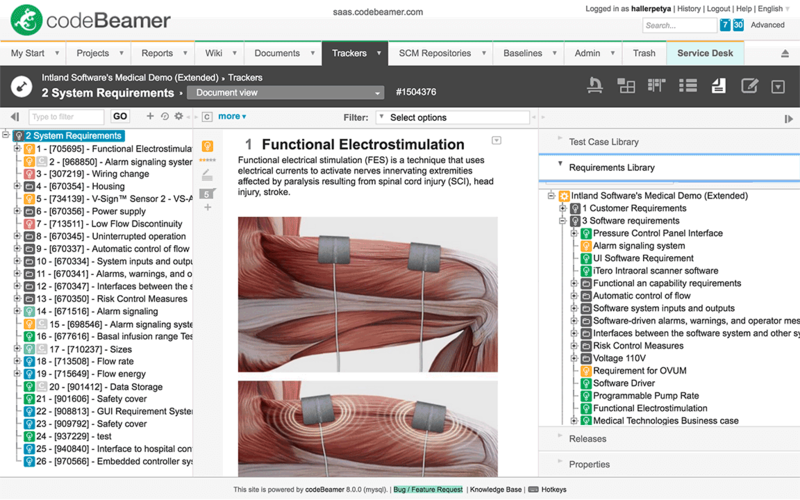 The integrated QA & Test Management feature set in codeBeamer helps you define test cases, link them to requirements, and execute parametrized tests on multiple hardware and software configurations. To facilitate variants management, tests can be saved to libraries for re-use any time. By associating tests with requirements and releases, codeBeamer ALM ensures complete traceability. Test result data mining is supported via filterable coverage analysis and statistics, and customizable analytics dashboards. Use visual analytics on the dashboard, share reports, and set up automatic reports. The Test Coverage Browser provides a simple way to analyze the status and results of tests related to requirements, filterable by trackers, releases and configurations. The Traceability Browser identifies and visualizes dependencies between all artifacts. The suspected link feature automatically indicates changes to requirements that might affect other artifacts. codeBeamer’s QA & Testing comes integrated with automated testing (via Jenkins). codeBeamer’s Agile Planning Board enables the convenient planning and management of releases and sprints. A simple drag and drop interface allows you to add requirements to releases, and Gantt charts can be used to visualize and manage your releases. Monitor progress via statistics, burndown charts, and custom dashboards to ensure deadlines are met. Capture the current state of your projects, including all your requirements and their relations to other artifacts in baselines that allow you to “travel back in time”. Follow a complete change history of all your work items in baselines. Browse and compare baselines at any point in time, and export reports to facilitate compliance audits. Ensure efficient and effective collaboration using codeBeamer. Among other features, the platform offers documents management functionality, flexibly configurable dashboards, customizable subscriptions (followed items) with e-mail notifications, activity streams, RSS feeds, a commitment planner & tracker, highly configurable Kanban boards, comments with attachments, and advanced automated workflows. Implement ChatOps using Slack or Mattermost to take enterprise collaboration to the next level. codeBeamer ALM’s collaborative features help you stay in control by accurately tracking and managing processes. codeBeamer has proven to be an Enterprise-level solution. Intland’s customer support is very responsive and quick to entertain any suggestions RT Logic may have for improvement and enhancement. RT Logic made an excellent choice when partnering with Intland. Also regarding RT Logic‘s yearly ISO audits for continued certification, codeBeamer reveals a convincing performance. Each of the auditors had very positive comments about the company‘s Project Portals and were especially impressed that each person with whom they spoke was able to find the requested information on the Portal and demonstrate its age and persistence. Is Requirements Management Software Obsolete?